There's nothing that beats the feeling of having a clear, glowing complexion. (We'd even go as far to say the triumph can rival a good hair day.) The problem? That feeling—especially during the dull doldrums of winter—feels almost completely foreign. Right about now, it's as remote as a sunshine-induced freckle. Between the polar vortex, skin-chapping winds, and a diet devoid of vegetables but rich in takeout, our skin has seen better, brighter days. And even if we've been diligent about our nightly skincare routine, wearing our sunscreen, and remembering to remove our makeup post–night out, the season can still bode doomsday dullness for our vulnerable complexions. So we're sharing the best 16 brightening serums that will help transform even the most fatigued of complexions. In addition to skimming reviews and our collection of A+ formulas, we asked around the office which elixirs have proven effective. Ahead, discover 19 of the best brightening serums. Happy scrolling! 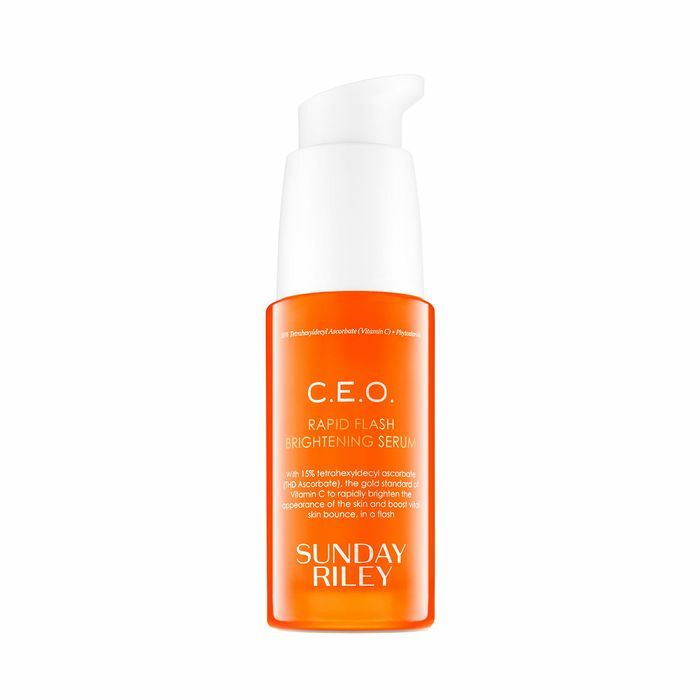 Fun fact: My fellow beauty editor Amanda Montell and I swear by this über-brightening face serum from Sunday Riley. It's also the top-rated brightening serum sold at Dermstore coming in under $100. I apply it every morning post-cleanser and toner, pre-sunscreen. And I never fail to get compliments on my "glowing" skin in the hours afterward. Say hello to perhaps the most iconic bottle of skin magic ever created. Yes, we realize that sounds a bit dramatic, but we honestly don't know of a celebrity, esthetician, dermatologist, or beauty editor who doesn't swear by this brightening acid serum from SkinCeuticals. As the name would suggest, the formula's effectiveness comes thanks to its perfected blend of vitamins C and E (and a strategic dose of ferulic acid to enhance the natural brightening benefits). We try our best not be brand repeaters in these types of roundups, but sometimes a brand is so exceptional or has multiple super-effective formulas suited for different skin types that we just can't resist. Case in point: this still new-ish launch from SkinCeuticals, which specifically targets discoloration, prompting a brighter, clearer complexion over time. I've been using it for months now, and (don't @ me!) I prefer it over the C E Ferulic. Plus it's a tad less expensive, so there's that. A huge key for brightness is exfoliation. Quite simply, your complexion will never be able to shine bright like a diamond if the icky stuff sitting on the surface isn't routinely sloughed away. Amanda and I keep this MVP serum on our nightstands and credit it as one of our favorite formulas for keeping our skin healthy, clear, and bright. It's created with the perfect ratio of lactic, glycolic, and salicylic acids, and since it comes from one of the best celebrity facialists in the business, Renée Rouleau, you know it's great. Victoria Hoff (the managing editor of our wellness sister site, The/Thirty) first turned me onto the magic of this Australian skincare brand, and it's been true love ever since. This formula in particular is a universal crowd-pleaser thanks to radiance-boosting ingredients like arbutin from bearberry and glabridin from licorice. It's also armed with plumping and hydrating benefactors like hyaluronic acid, rose extract, and phyto-complex actives. Yes, this natural serum is spendy, but its brightening perks make it a worthy investment. It's actually the one and only product from the brand, and it's racked up an astronomical following in a super-short time. Here's the scoop: It boasts 22 different botanicals and over 60 bioavailable nutrients that all work synergistically to promote healthy, radiant, youthful skin. This little force of nature from popular K-beauty brand CosRx is proof that an effective brightening serum doesn't have to steal a significant chunk of your paycheck. It contains 20.5% pure vitamin C and 72% black chokeberry, which stabilizes and enhances the effect of the vitamin C. Together, it's a liquid-gold power couple that brightens the appearance of acne scars, browns spots, dullness, and other forms of pigmentation. Noticing a trend? Chock-full of skin-invigorating fares like 20% vitamin C, hyaluronic acid, and additional antioxidants for good measure, this serum is specifically designed to brighten discoloration while also boosting collagen and elastin for a smoother, plumper complexion. We love French drugstore brand La Roche-Posay because it makes some of the best, most effective formulas at a far-less-frightening cost per wear than most other staples. Plus it's a two-for-one deal! You'll get brightening perks from the formula's helping of vitamin C and E and sufficient sun protection courtesy of SPF 50. And if you're worried about its texture, don't—it's remarkably lightweight. We're not going to hide anything here—if you're in want of a less-expensive dupe for some of the spendier product on our list, this will be one of your best bets when it comes to brightening on a budget. This option from Paula's Choice is a favorite at Dermstore. It's enriched with a glow-getting recipe your skin will love, like vitamins C and E, ferulic acid, antioxidants aplenty, and peptides. By Terry is one of the dreamiest French makeup brands, and as it so happens, it does damn well with its smaller selection of covetable skincare picks as well. This luxe serum is a go-to of makeup artists (it's great for prepping skin pre-foundation) and features a roster of lightweight ingredients that'll basically trick your skin into thinking you're Benjamin Button. Think natural white rose cells, brightening botanical extracts, flower acids, vitamins, and amino acids. True, this might well be the most expensive brightening serum known to mankind, but the reviews and overwhelming love for Dr. Sturm's serum don't lie—this is the Lamborghini of skincare. Yes, it works to improve a dull, uneven complexion overtime, but it also quenches our thirst for instant gratification when it comes to immediate glow and brightness. Which, to be honest, is where many brightening serums out there struggle to keep up. Norwegian kelp extract, sugar cane, bilberry leaf, alpha-arbutin, mushroom, white willow bark… If we didn't know better, we'd think we were reading off the ingredients skin-improving potion from the library at Hogwarts. However, it's actually iS Clinical's beloved brightening concoction, which has an equally fantastical name: White Lightning. The texture is surprisingly lightweight, and it works to prevent the worsening of dark spots while simultaneously resurfacing dead skin cells without causing irritation. It's truly magical. Not only does this luminosity in liquid form feature ferulic acid, but it's also infused with retinol and brightening extracts (e.g., licorice root and bearberry). Together, they'll transform the texture of your skin (smooth and plump!) while reducing other symptoms like fine lines and dullness. Another office favorite, we're big fans of this oil/serum hybrid from Caudalíe thanks to its impressive detoxifying powers, which the brand compares to a nice, healthy green juice. Working overtime while you sleep, its collection of organic essential oils like neroli, lavender, carrot, and white sandalwood help nix aggressors that can cause harm to our skin and undermine our glow efforts. Not all serums are suitable for all skin types, but this oil-free one—concocted with prettifying stuff like vitamin C, collagen, and extracts from orange and green tea—is. It's a cult favorite for a reason, and its penchant for fast absorption, blinding brightness, and delectable scent (so many serums make us wrinkle our noses) serve as proof. Maya Chia is absolutely the best skincare brand that no one knows about—yet. I hoard everything from the brand, as it reverses even my scariest of skin days—transforming drab dullness to a beaming beacon of brightness. (Too much alliteration?) But back to the skin-changing issue at hand—the formula. It features the brand's hero ingredient, chia seed oil (which plays nice even if you're acne-prone), and one of the world's most potent antioxidants astaxanthin, which is said to 65 times stronger than vitamin C and 14 times stronger than vitamin E in the fight against free radicals. Next up, I own 27 eye creams, but these are the only ones I recommend to my friends.